Are you craving sweet and delicious taffy? 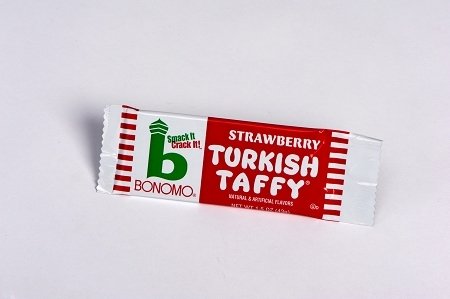 Bonomo Turkish Taffy will satisfy your craving and have you reaching for more of this one-of-a-kind candy! Bonomo’s Turkish Taffy provides entertainment as you crack off piece after piece. Get your strawberry taffy bar today and learn why Bonomo has enchanted people of all ages for decades! Smack-it, Crack-it! It’s taffy-rific! Want to try out some different flavors? Check out our other product pages to find more available flavors and a variety of sizes!